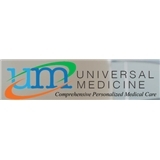 Universal Medicine (Edgewater) - Book Appointment Online! My experience as a first time patient with Dr. Rotoli was excellent. From the ease of scheduling the appointment through ZocDoc, along with the helpfulness of the front staff to accommodate me with an earlier appointment, I already knew that I was dealing with a great provider/office. I had little to no wait and was seen even before my scheduled appointment. Dr. Rotoli was very friendly and down to earth. I especially liked how he took his time to listen and involve me in planning out how we would tackle my medical conditions. I highly recommend him to anyone looking for an internist!